It is very important to Mark Your Child’s Attendance for events when your coach uses our scheduling system. You will see buttons that say Will be There or Can’t Make it on all events that are listed on your teams schedule. 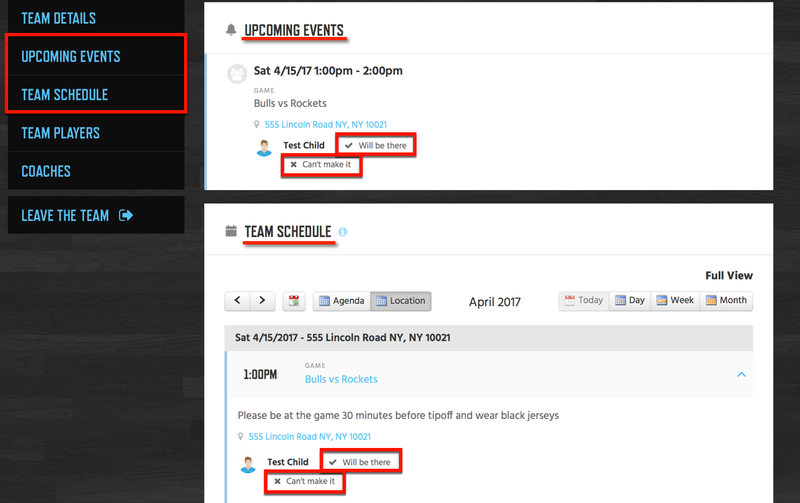 You will find your teams events on Upcoming Events on your Dashboard and In your Team, as well as on your Team Schedule in your team. You can learn more about how this works an where the buttons are located below. Note: When you click Can’t Make it on an event your coach will be notified with an email and text alert. If you click Will be There he/she will not UNLESS you had previously clicked Can’t Make it and changed your mind.